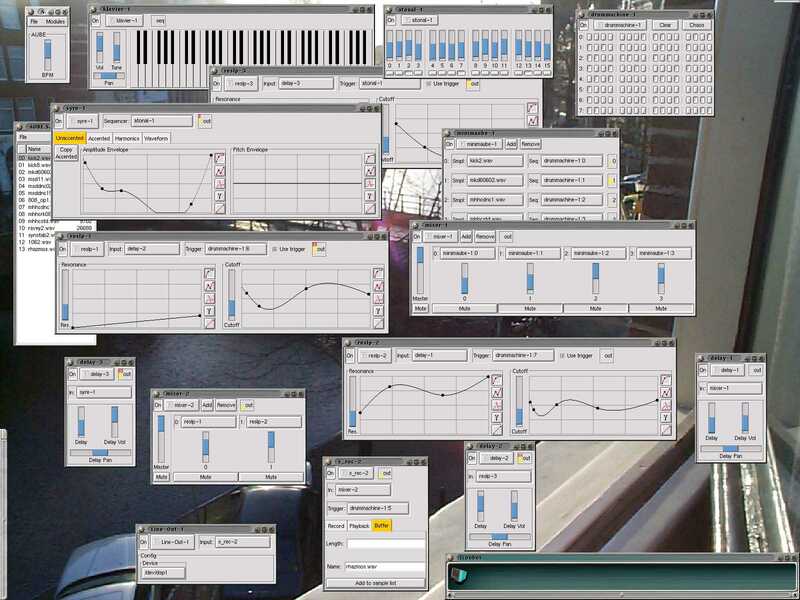 AUBE (pronounced 'obey') is a system for sound generation and processing. It is Free Software, available under the GNU General Public Licence. 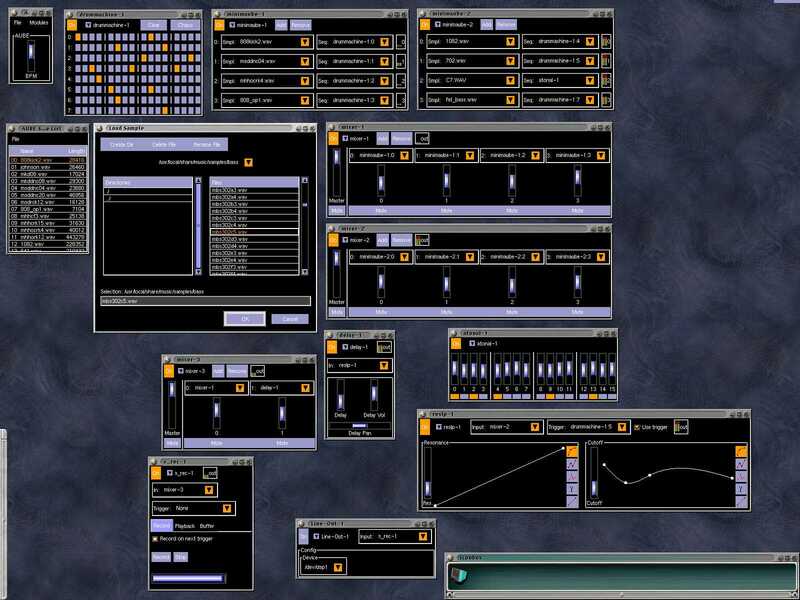 AUBE can process audio on the fly; the user set up arbitrary configuration of sound sequencers, generators and effects modules, through which sound is generated, filtered, recorded etc. 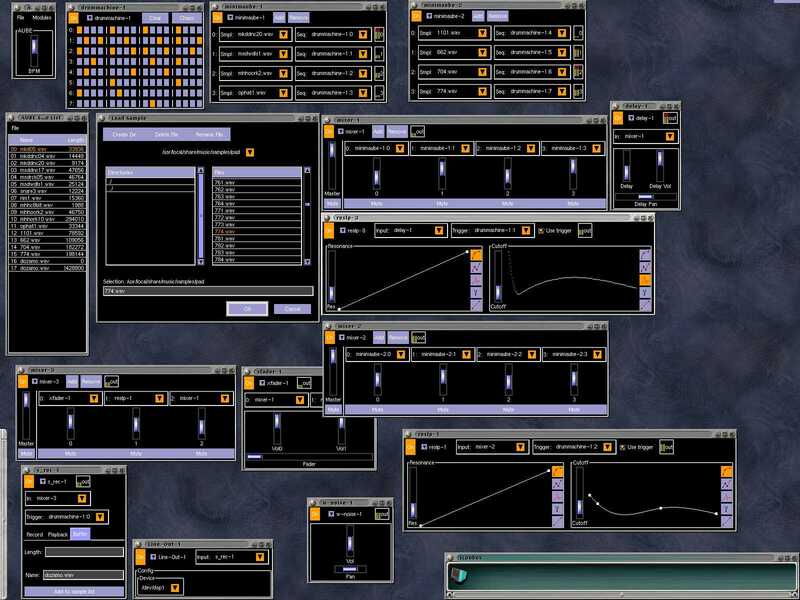 There is also support for loaded samples which can be sequenced (like a tracker) and edited. 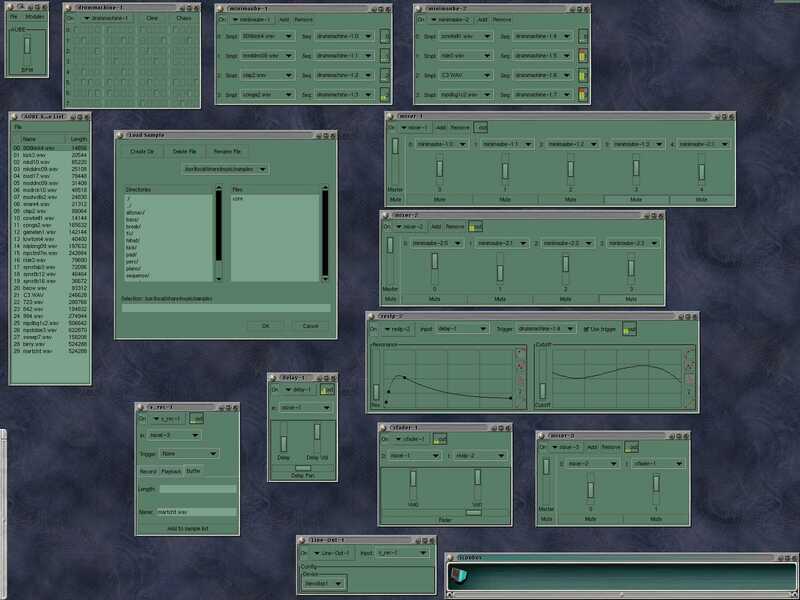 syre, a soft synthesiser based on additive synthesis, with control of harmonics and arbitrary envelopes for controlling amplitude and pitch over the duration of a note. a resonant low pass filter, with envelopes for modulating the amount of resonance and the cutoff frequency. This filter is triggered by a sequencer. a delay module, for inserting an echo into an audio stream. a 4-way panner, which splits a stereo stream into forward and rear stereo streams for "quadraphonic" sound. a sample recorder, for recording generated sounds so they can be sequenced, played back and saved. Line In and Out modules, for reading from or writing to soundcards using the /dev/dsp interface (ie. Open Sound System compatability). Support for ALSA and ESounD is being worked on. There's a mailing list you can subscribe to to receive updates about new releases of aube. To join, send a message with 'subscribe' in the subject to conradp.aube-request@cse.unsw.edu.au. View some screenshots of AUBE in action. If you've got some nice screenshots of AUBE running send me URL's! 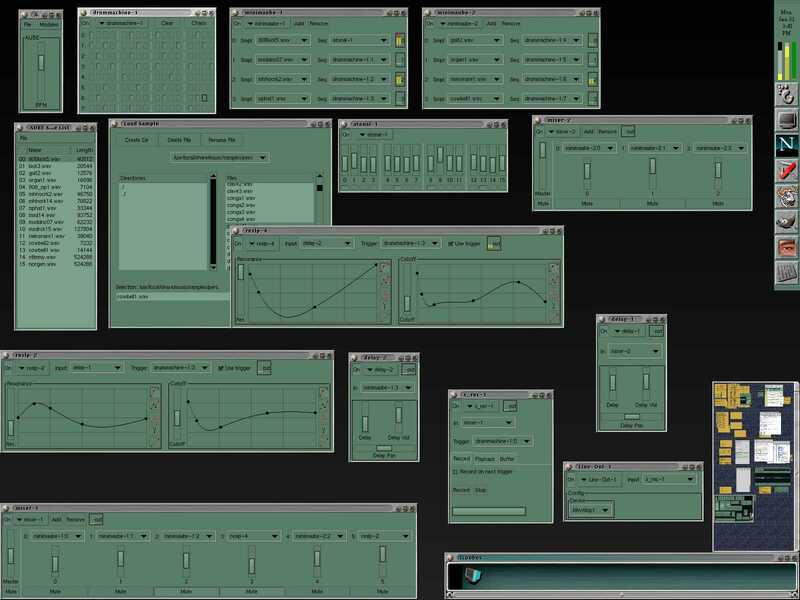 I made some sounds for Gnome desktop events using aube. You can get them from here. The following are available at: ftp://ftp.cse.unsw.edu.au/pub/users/conradp/aube/example_sounds/ and via http at dl/example_sounds/. Kobi-Stapbz_20000201 [ftp] [http] (96k MP3) [0:05] -- uhuh ... and gimme some synth with that. Kobi-Martcht_20000202 [ftp] [http] (96k MP3) [0:05] (Screenshot) -- Bury that rhythm, baby. You'll need the Audio File Library to make use of sample loading and saving (also available with Gnome) -- make sure to get a recent version of audiofile (eg. >=0.1.11), as earlier versions had problems loading some kinds of files. For AUBE 0.21.0 and 0.21.1 you need libxml, which is now a standard part of Gnome. However, libxml has changed since AUBE 0.21.1 was released and the xml support no longer compiles. Versions 0.21.1a, 0.21.1b and 0.21.1c address this problem, but do not support the loading and saving of module setups. Here's a quick start guide to getting sounds out of aube.